Carlyle Farms is home to 2,500 dairy cows in Wayne, Ohio. Sam and Michelle Dilsaver work closely with their 22 full-time employees to care for their cows and natural resources to produce high-quality milk. After growing up on a dairy farm in California, why did you choose to continue dairy farming instead of pursuing something else? Sam: I just really love the cows, and I love working with other people. We’ve really stuck with it because we love what we do. It’s good for the family. The kids get out here, and they get to learn to work with the cows. We teach them what to look for, so they can say, “You know what, Dad, I was driving to the barn, and there’s a cow that maybe we should go look at.” They just really know what to look for, and they like it and like to be involved. 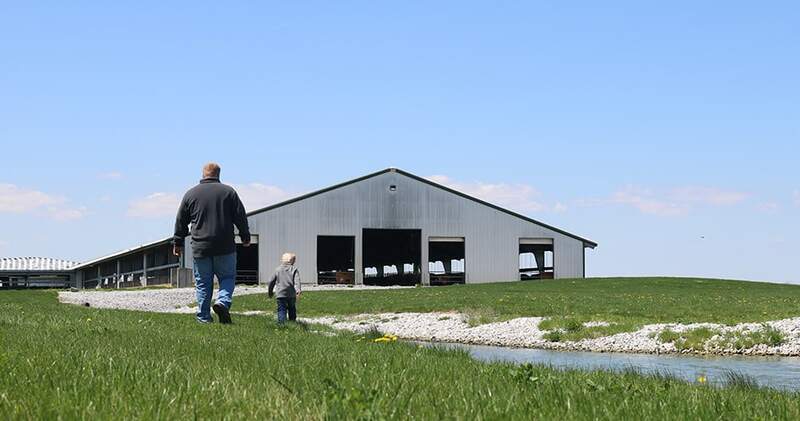 Hear Ohio dairy farmer Sam Dilsaver explain how he trains and works with employees to care for the cows at Carlyle Farms. What happens to all the manure from your farm? Sam: We go through the pen three times a day—basically each time the cow is milked. When the cows are in the parlor getting milked, we have a vacuum truck that goes through the barns and vacuums all the sand and manure out of it and cleans the alleys for the cows. If there’s any manure in the free-stall bed where the cows lay, we clean it out. Then we take that manure over to a sand lane. We recycle our sand, so all that manure is unloaded into what we call our “lazy river.” That’s where the sand is separated from basically the manure and the water. The manure is pumped up into a slope screen, where then the solids are separated from the liquid. The solids are stored on a concrete pad, and the liquid goes to our four-stage lagoon system. Our farm has clay lagoons, with a four-foot clay liner in them. We have enough storage for about 500 days. How do you minimize odors from your farm? Sam: There are lots of good additives that you can put in your lagoon with bacteria and microbials that really help make it to where the odor is to a minimum. It’s always going to stink a little the day we apply it to fields, but we try to control it the best we can. My house is just a couple hundred feet from the from the from the farm, and we like our house to smell nice inside as well. So, we try to do everything possible to make life enjoyable for everyone.